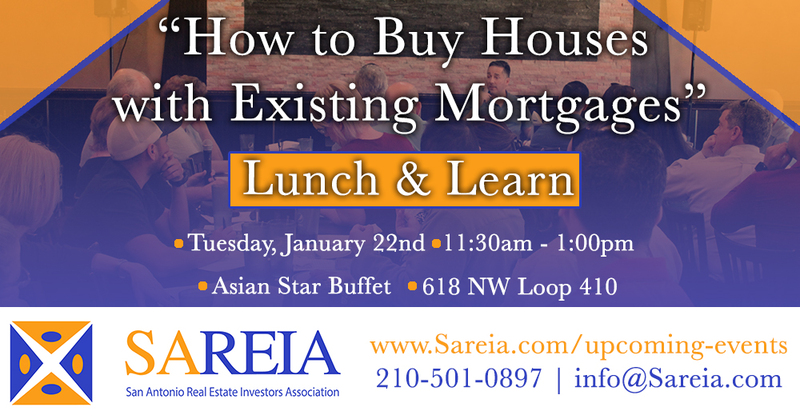 San Antonio Real Estate Investors Association - Lunch & Learn - "How to Buy Houses with Existing Mortgage"
Lunch & Learn - "How to Buy Houses with Existing Mortgage"
Please join us for lunch as we discuss how to buy houses using the Subject-To Existing mortgage method. Buying subject to" means buying a home subject to the existing mortgage. It means the seller is not paying off the existing mortgage and the buyer is taking over the payments. The unpaid balance of the existing mortgage is then calculated as part of the buyer's purchase price.